We may have millions of edges in our graph. What if we want to look at a specific edge? 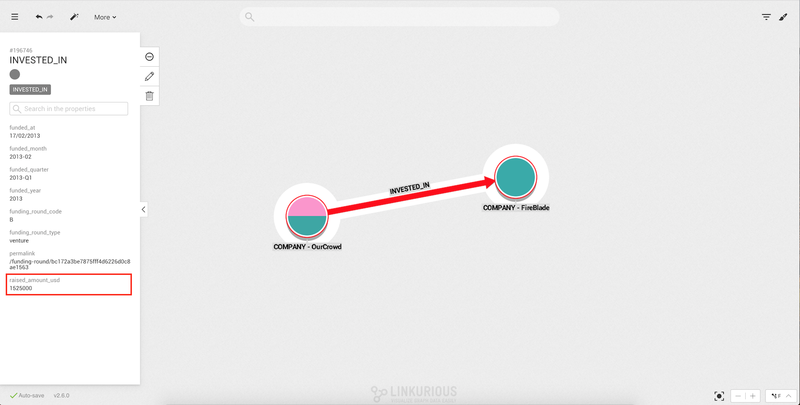 The fastest way is to use the search bar in the Linkurious Enterprise interface after we have have created a new visualization. By default the finder will be set to find all nodes in the database. To search an edge, we click on the Edges button after typing the search value. To search only the edges present in the visualization, we click on the LOCAL button. The search for edges works exactly like the search for nodes. We simply type what we are looking for. We see the list of suggestions that match our search. In the search result, we can see that there is an edge that has the value 1925000 for the property raised_amount_usd. We choose the result we are interested in by clicking on it. It is immediately added to the workspace where we can visualize it.